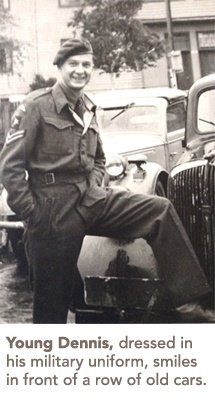 As a paratrooper in the Second World War, Sergeant Dennis Cutting has seen a thing or two, even from a bridge too far. Dennis Cutting is no stranger to the sound of the wind rushing in his ears. A sergeant in the 250th. 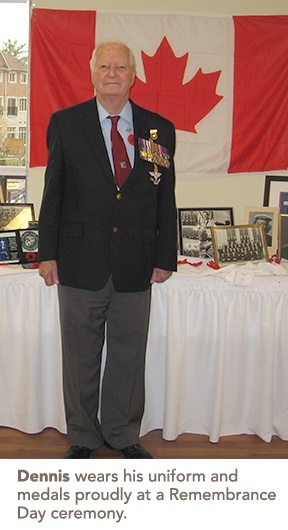 Light Company RASC 1st Airborne Division, Dennis served as a paratrooper in the Second World War. He enlisted in the British Army when he was only 18 years old. Not many people have the courage to free-fall 13,000 feet from a plane with only a parachute to save them, fewer still are willing to do so in enemy territory. Even so, on September 17th 1944, at the age of 21, Dennis dropped at Oosterbeek, Holland, in Operation Market Garden. If the name sounds familiar, there’s a reason. The well-known film A Bridge Too Far, directed by Richard Attenborough, was based off the failed Allied mission, which saw eight in 10 men to an early grave. On top of an overwhelming enemy, the men also faced shortages. They had only packed enough rations and ammunition for 48 hours, but were gone nine days. Of the 10,000 men in the 1st Airborne Division to enter the conflict, only 2,000 survived. Dennis was one. “It was a hellish battle,” Dennis said. Dennis also served in Africa, Norway, Palestine, and Italy. His four brothers served in the war as well, and all were lucky enough to return home. In 1957, Dennis, his wife Greta, and their three daughters immigrated to Canada from England. The war was long over. However, this would not be the end of Dennis’s paratrooper days. At the age of 71, Dennis once again dropped 13,000 feet at Oosterbeek, in commemoration of the 50th Anniversary of the battle, and to raise money for Dutch charities. He’d had to prepare for a year before the event, taking part in five practice jumps. Dennis and Greta returned to Arnhem, Holland for several years after this to attend a reunion and pilgrimage held on September 17th to mark the battle, and were hosted by Dutch families during their stay. Though many years have passed, Dennis is still proud of his uniform, which he wears every year at the Remembrance Day services held at Bradford Valley Care Community in Bradford.